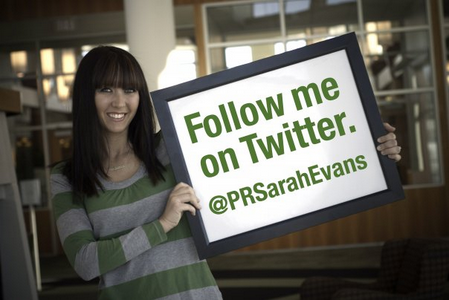 One of the most listened to voices in the Social Media world belongs to Sarah Evans and her blog Sarah’s Faves. Sarah has become a leading Social Media thinker and has just joined the company Trackly as Chief Evangelist. She’s well known in Public Relations and Social Media circles as an innovator, big thinker, and one of the best and brightest in the online world. Sarah handpicked three people who should be working in Social Media or Public Relations and posted their stories on her blog. I was honored to be one of the three people she thinks should be hired, and here’s what she had to say about me and my work. Dream job title: Employee. I’m able to help in so many ways that I’ll let you, the employer, decide how I can help you best and what to call me. Three adjectives that describe you: experienced, innovative, connectedIf I’m hired by your organization I will: bring unmatched experience, knowledge, enthusiasm, and new levels of success to you. What kind of culture are you looking for? An environment that has energy, teamwork, and a culture of cooperation. I’ve worked in small offices, huge offices, and alone. The culture of the organization I join should foster creativity, no matter how many people are in the office. What’s your most impressive professional accomplishment? What about personal? Almost singlehandedly and secretly building and launching a brand new radio station, including a full suite of social media outposts and a marketing plan, in 18 days last year in Kansas City. Personally, I’m most proud of my three incredible sons. You can’t do anything more important than being a parent. How many years experience do you have? 27 as a content creator, brand manager, and marketer using a score of traditional and new media resources. Where should your ideal job be based? St. Louis, MO because it’s the best place I’ve ever lived to raise a family. Are you willing to relocate? YES, Chicagoland would be my first choice, but I’ll go anywhere for the right job. I can also use the miracle of the Interwebz to work from World Headquarters in St. Louis. Want to hire Mark? Email him at edwardsmark@gmail[.]com. It’s truly an honor to be recognized by a heavy hitter like Sarah, and yes, I’m available now for full time employment or project work through Mark Edwards Worldwide. If you’d like to talk about how I can help your organization, please use any of the methods in Sarah’s post to contact me. You’ll be glad you did!